The top quality version of the classic. Crystalline playing tiles crafted of smooth, solid plastic - called urea - giving a heftier feel. The center of each tile features a brass spinner that makes the tiles easier to mix. 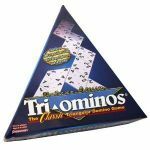 Contents: 56 Deluxe Tri-ominoes tiles with brass spinners, 4 racks and instructions.